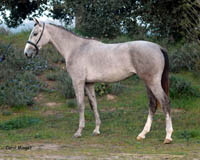 By an American Warmblood Registry stallion, out of a Spanish-Egyptian mare. 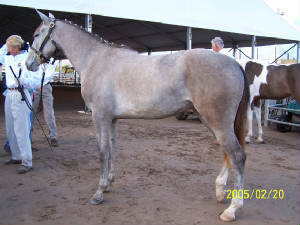 Gevalia Bay is a grey 2003 filly registered with the AHA Half-Arabian Association and approved into the American Warmblood Registry. Her dam is out of an *Anwarr daughter (Morafic) and by a Spanish imported stallion. Sire is by a Dutch Warmblood stallion, out of a Hannoverian mare, and inspected, approved, branded and registered in the American Warmblood Registry. Gevalia Bay is nominated in the Arabian Sweepstakes. Gevalia Bay was started under saddle in winter 2005. Val is a lovely youngster with beautiful movement. For sale - Private Treaty. She spent the winter in training with Patience Prine Carr and went to SCOTTSDALE. Val did well, placing 4th in her class of 9. Hilda Gurney was very complimentary, giving her alot of 8s. One of our nicest all round sport half Arab/Warmblood prospects!